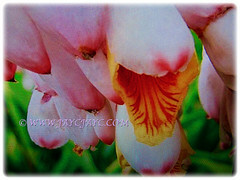 The Shell Ginger or Pink Porcelain Lily is an awesome flowering plant. 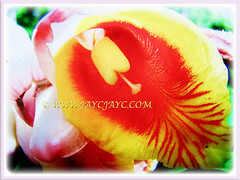 It produces very attractive orchid-like blossoms that is also scented. This beauty will definitely be included in our next garden shopping list. Hopefully it’s sooner and not later! 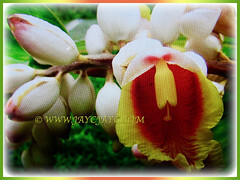 Botanical Name: Alpinia zerumbet (syn. 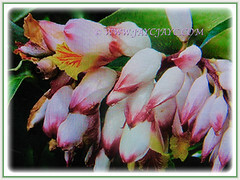 : Alpinia nutans, Alpinia speciosa, Zerumbet speciosum). 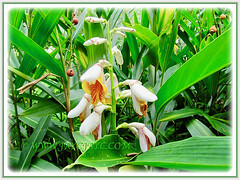 Common Names: Shell Ginger, Shellflower, Butterfly Ginger, Pink Porcelain Lily, Light Galangal. Etymology: The genus Alpinia is named in honour of the Italian botanist Prospero Alpino, a 17th-century Italian botanist who specialized in exotic plants. The specific epithet zerumbet is of Arabic origin and seems to have been first used by Serapion, an eleventh-century physician and scholar for the aromatic roots. Origin: Native to eastern Asia that includes China, Japan, India, Indo-China and Malaysia. It is popularly cultivated worldwide. Plant type: An ornamental and perennial flowering plant. 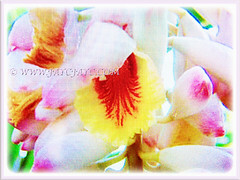 Features: Alpinia zerumbet is from the genus, Alpinia that consists of about 200 species of flowering plants. With a vigorous growing rate, this rhizomatous and evergreen tropical perennial grows in upright clumps that can reach 2.4-3.0 m tall in tropical climes. Its rhizomes have a ginger-like aroma. The evergreen and lance-shaped green leaves, measuring up to 0.5 m long and 15 cm across are arranged spirally along the stem. It bears funnel-shaped flowers that appear in drooping racemes up to 30.5 cm long. The blossoms are showy and fragrant. 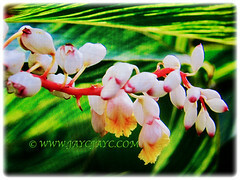 The waxy flowers have white or light pink perianths with yellow labella with red spots and stripes. It is most commonly called Shell Ginger and Shellflower because its individual pink flowers resemble sea shells, especially when in bud. There are three stamens but only one has pollen and one pistil. 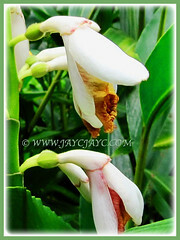 It is distinguished from other members of the ginger family by the fact that its flowers droop from the ends of leafy stems rather than rise directly from plant rhizomes. The flowers will be followed by globose fruits with many striations. 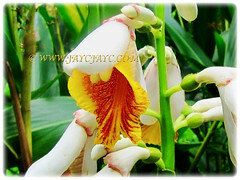 Culture (Care): Alpinia zerumbet or Shell Ginger can be easily grown with a little extra care. Moisture: Lots of water with occasional misting. Water regularly especially during the hot seasons. Soils must not be allowed to dry out. Others: Prune as required to control plant size, especially for tall and leggy plants. This will stimulate strong new growth. Deadhead to encourage new flowering growth. Remove faded and withered leaves to keep it aesthetically pleasing. Feed once monthly with a balanced fertilizer for flowering plants with a higher phosphorous content. Never over fertilize, otherwise you’ll get lots of leafy growth and fewer flowers. Generally free from serious pests and disease problems. Nevertheless, watch out for mealybugs, red spider mites and aphids. For subtropical and temperate regions: Hardiness: USDA Zone 8 – 11. Cold temperatures can freeze the stems of Alpinia zerumbet to the ground but new growth will emerge as warm spring weather arrives. If grown as a houseplant in the greenhouse, it must have bright light and humid conditions. A cultivar with variegated leaves that is more compact and shorter is most ideal as a houseplant. It may also be grown outdoors in the garden, but rhizomes should be dug and stored indoors for winter in a dry medium in a cool room until the danger of frost is over. Plants will not flower until the second year as they flower on old growth. A seasonal bloomer that flowers during mid spring. Propagation: Easily propagated by pieces of its rhizome, division of clumps or seeds. Usage: Alpinia zerumbet or Pink Porcelain Lily with its captivating ornamental flowers will be excellent as a landscape, accent or specimen plant. Suitable in flowerbed and border. Ideal for container gardening, both outdoors and indoors. Japan uses the leaves to wrap rice dumpling and sometimes used as tea. In certain regions, it is used in folklore medicines. 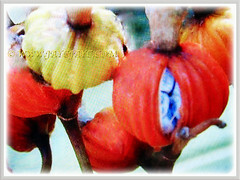 Its leaves are used as an anti-hypertension and anti-stress medication, as well as to relieve fever and malaria.